In my journey as a writer, I have had the privilege of meeting many mentors from whom I’ve learnt many things about structure, plotting, how to develop characters and other nuances of writing. Laurie Schnebly Campbell is one such mentor. Laurie is a romance author and has a background as a counselling therapist. A perfect combination that helps her in what she loves to do—give online (as well as offline) writer workshops to students from London and Los Angeles, New Zealand and India. She is also an advertising professional and works for a Phoenix ad agency. For several years, she would turn off her computer every day at five o’ clock, wait thirty seconds, turn it on again and start writing romance. Her first novel was nominated by Romantic Times as the year’s “Best First Series Romance” and her second beat out Nora Roberts for “Best Special Edition of the Year”. She has also written non-fiction and her book Creating Believable Characters with Enneagrams is a must-read for fiction writers. 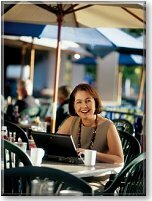 It gives me great pleasure to welcome Laurie to my blog and find out more about her and her writing workshops. I first came across your book Creating Believable Characters with Enneagrams and was totally blown away by the concept of using personality types to create compelling characters with realistic flaws. Can you tell us a bit about how that book happened and what made you write the book? I was blown away, too, when I first came across the concept of enneagrams. My mother had gone back to school to study counseling — she now works as a marriage counselor — and found a great book called “The Enneagram Made Easy” by Renee Baron and Elizabeth Wagele. I loved how each of the nine personality types has its own unique strengths while at the same time, any strength taken too far can become a flaw. Plot Via Motivation is one of the best classes I have taken. Can you tell us in brief about the class and how it helps writers to think about the issues of plot and motivation. Do you think the model that you teach applies for romance books (by and large) or can it be used for other genres as well? We all hear about how characters need a goal, a conflict on the way to that goal, and a motivation that drives them toward it. But often we don’t use the character’s motivation as fully as we could in order to create someone readers can identify with, even if they don’t want to BE that person. Drilling down into what people need to feel Okay is what makes a character fascinating, and I’ve discovered that once a writer can identify THAT the book takes on a whole new dimension of credibility. While that definitely works for romances, in which readers care deeply about the characters’ internal feelings, it works equally well for action-adventure or fantasy or mystery books in which readers want to feel like each character makes perfect sense. Many people feel that writing cannot be taught? Your thoughts? 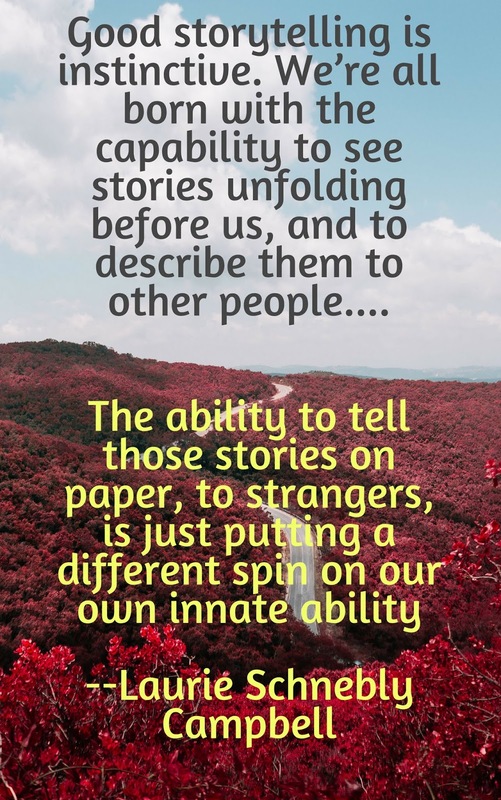 The ability to tell those stories on paper, to strangers, is just putting a different spin on our own innate ability. Techniques that make writing easier can absolutely be taught, and good writers are always looking for the most effective tools they can use, but the natural instinct for storytelling doesn’t have to be taught. It’s already there. What kind of books do you enjoy reading? 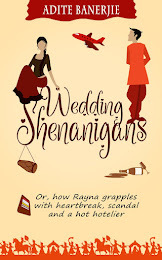 Any titles that you found 'unputdownable'? Any genres that you don't read? About 95% of my reading is fiction. Lately my favorite genre has been women’s fiction — stories about relationships, whether or not there’s any romance involved. But I also enjoy thrillers, mysteries, romances, young adult and even some children’s books. I don’t read as much SFF, although there’ve been some I loved, and I never read horror because I just don’t like to be scared. The one book I read cover to cover, then turned back to page 1 and read the whole thing straight through again, is a coming-of-age-story called Greensleeves by Eloise Jarvis McGraw. I always have three books on my nightstand, 2-15 on my from-the-library shelf, and another one in my car. You have yourself been a very successful romance author. What are some of the issues that you feel have changed since the time you wrote books? And have these changes been for the better or have things gotten worse? When I started publishing with Harlequin Romance’s American subsidiary, Silhouette Special Edition, the only way to get published was through a well-known house. That was in the 1990s, a few years before e-books and indie publishing changed the landscape dramatically. Now, anyone who wants to publish a book can do so, which makes life easier for people who love having lots of titles available and harder for people who want to read only the best ones. I’ve been hearing for years that electronic publishing will mean the death of print books, and recently was delighted to learn that people who previously didn’t read (because they couldn’t make time for it) have now discovered the joy of stories they can read on their phone. They not only buy books for their phone, they’re also buying print because they love getting lost in a good story. Which is great news for all of us writers. What would your advice be to a writer who is starting out? If you’ve always been good at writing papers and reports for school and work, you might feel like there’s something wrong when you don’t achieve instant success in writing fiction as well. That’s a normal response. There’s a learning curve to writing stories, same as for writing non-fiction, and it applies just as much to experienced writers as to absolute beginners. You can make your job easier by identifying which you’re better at: coming up with characters, or coming up with plots. Neither is more important, but almost everyone is better at one or the other. Whichever is your weak point, START there. Because if you’re great at plots but not so great at characters, you can use your natural talent to come up with a plot that’ll suit whatever characters you’ve struggled to create. 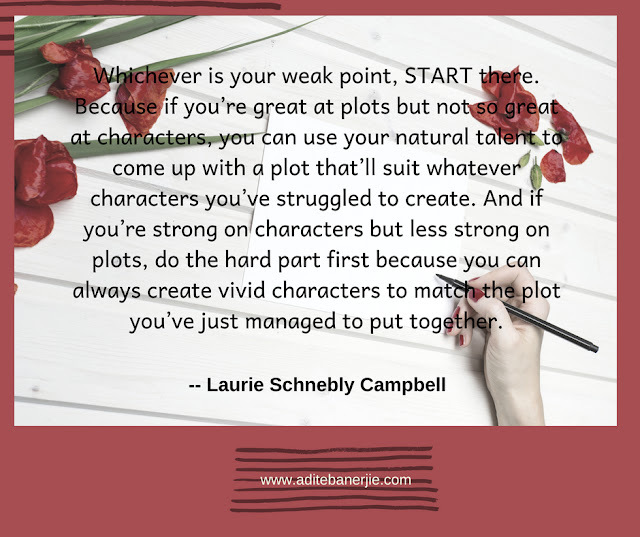 And if you’re strong on characters but less strong on plots, do the hard part first because you can always create vivid characters to match the plot you’ve just managed to put together. 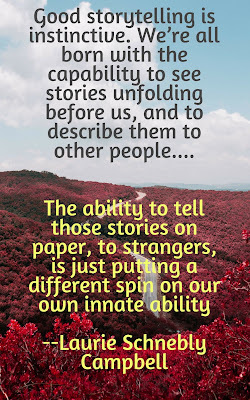 Finally, if you spend much time with other writers, you might tend to forget what a rare gift you have because you see it in everyone around you. But if you go into a convenience store and ask “how many people here are writing a book?” it’s not likely anyone will speak up. Don’t take your unusual status for granted. Appreciate the fact that you’ve been given a talent and drive and desire that not many people get, and honor it. Are you developing any new course that you're excited about? And could you share some details. I try to come up with a new course every year, because I teach one via email every month except July and December, but students often like to repeat classes like “Plotting Via Motivation” or “The Heroine’s Journey” or “Your Plot-Character-Story Braid” year after year. So, since I didn’t add any new ones in 2018, I’m adding three in 2019. February’s is “The Whole Point of Point Of View.” In theory, POV is simple: whose head is the reader in? In practice, it can be a more tricky. Whose head is best for this scene, this section, this story, this series? How do you know when it’s time to switch? What if the reader gets bored? What if the POV character doesn’t know something you want the reader to know? We'll cover the 11 techniques that make Point of View easier to work with, no matter who your readers will be. June’s is “Boffo Beginnings and Fab Finales.” How can you make sure your book will draw readers in from the very first paragraph, through the next several pages, continuing into further chapters until they realize they’ve been reading so fast and so deep they can’t put this story down? How can you leave them so wonderfully satisfied when they reach The End that they’re already vowing to read whatever else you’ve written and are going to write next? That’s what this class is about. And August’s is “More Than Setting: World Building.” Of course your book needs a setting that contributes to the story, but your characters’ story world goes far beyond just the time and place they occupy. It’s also the people who surround them, the expectations they take for granted, the rules that infuriate them, the attitudes they share with their society whether or not they realize it. All those elements (and more) belong in your story world…and here’s how to build a world that works. Thanks, Adite, for some great questions — it’s been a treat watching you grow as a writer, and I love that you’re sharing your gift with blog readers as well as those who enjoy your books and screenplays! Thank YOU Laurie for those great tips. And, people, do check out Laurie’s online classes if you want to hone your skills as a writer. Her classes are also a lot of fun! Imagine, I even enjoy doing the homework she doles out! Adite, you chose such perfect quotes for the graphics -- I love those! Glad you like them, Laurie! Thanks once again for sharing your knowledge and doing what you do. Laurie is a real inspiration. Having met her, heard her I can really relate to this post of yours Adite. Great material for upcoming writers like me. Thank you Laurie. Always an inspiration. One of these days, Adite -- I'll never forget that you invited me to visit anytime I'm in India! And, Rubina, I still look back on that library workshop where I got to meet you as being a highlight of the day...any chance you'll be coming to that same event this year? I would love to Laurie. That one meeting with you changed my perception as to how I see a character. I remember what you said that day. I will try my best to make it this year. Rubina, it'll be on November 3 -- I'm not yet sure which time slot or room I'll be speaking in, but I'll hope to see you! Kathleen, isn't it amazing what a good interviewer can do? I'm like you; I was bowled over by the caliber of Adite's questions. And, BOY, do I hear you about wondering what's wrong when fiction is hard...the only consolation for people who got their start in non-fiction is that at least there's never any problem with the basics like grammar and punctuation that often trouble other beginning writers. Gotta like having SOMETHING come easy! Cover Reveal of "Bombay Heights"